In 2001, bestselling author and speaker Rick Johnson founded Better Dads, based on the urgent need to empower men to lead and serve in their families and communities. Rick’s books have expanded his work to include influencing the whole family, with life-changing insights for men and women on parenting, marriage, and personal growth. Inspiring and equipping through innovative multimedia presentations and seminars, Rick’s resources, methods and personal approach have been transforming the lives of men, women, and their families for over ten years. Rick speaks at many large conferences across the US and Canada and is a popular keynote speaker at men’s and women’s retreats and conferences on parenting and marriage. Rick also speaks at mental health conferences, home schooling conferences, various marriage conferences, and the armed forces. He is a nationally recognized expert in several areas having been asked to deliver papers at venues such as the County of Los Angeles Child Abuse Prevention Conference and the State of New York Fatherhood Conference. Rick’s work with men and fathers was recognized when he was invited to the White House as part of the Champions of Change ceremony in 2012. Prior to becoming a bestselling author and speaker, Rick was a small business owner for 16 years, owning and operating an environmental engineering firm. He attended George Fox University receiving a Bachelor of Arts degree in Management and Organizational Leadership, and has a Masters Degree in Education from Concordia University. He is a veteran of the United States Navy, has served on the Board of Directors for several community and business associations, and coaches high school basketball in his spare time. Rick has been featured in many national publications such as New Man Magazine, Crosswalk.com, Christianity.com, Christianity Today’s Men of Integrity, Relevant Magazine, Pentecostal Evangel, Thriving Family, and Proverbs 31 Ministries Magazine. He is the bestselling author of the books, That’s My Son: How Moms Can Influence Boys to Become Men of Character, Better Dads Stronger Sons: How Fathers Can Guide Boys to Become Men of Character, The Man Whisperer—Speaking a Man’s Language to Bring Out His Best, That’s My Teenage Son: How Moms Can Influence Boys to Become Good Men, and The Power of a Man: Using Your Influence as a Man of Character all by Revell Publishing. Rick Johnson, tells how he came to faith in Christ during his fathering years. Johnson explains how his parenting changed for the better once he understood the meaning of grace and forgiveness. 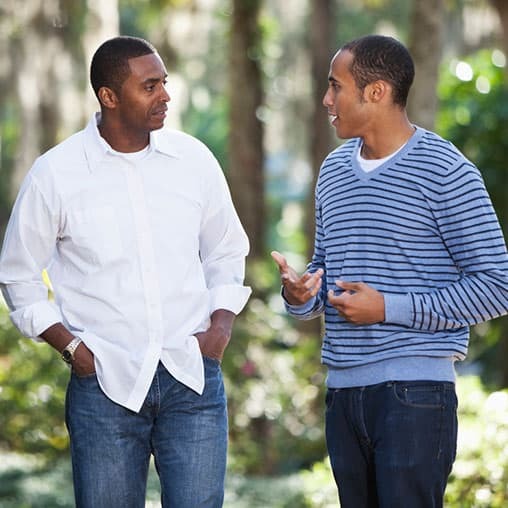 Rick Johnson talks about the men who helped shape his own parenting style, and encourages men to either find a mentor or become a mentor to another man.